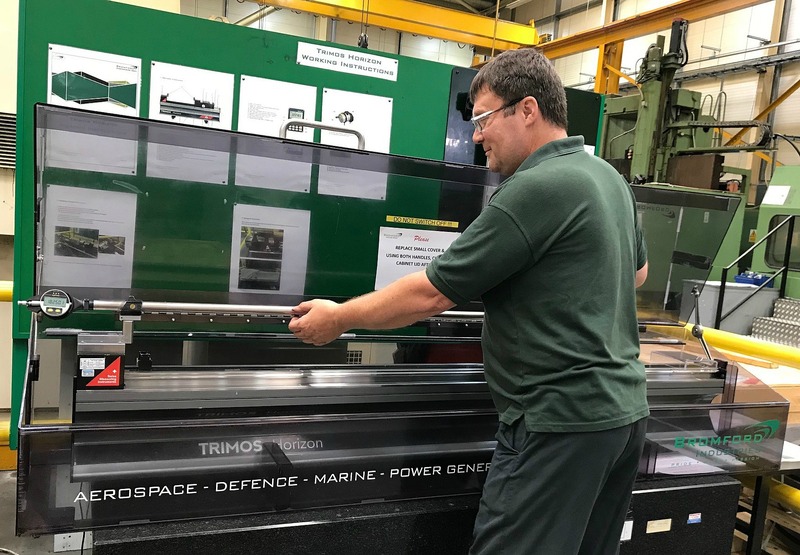 Bowers Group has supplied Bromford Industries with a Trimos Horizon ‘H’ Series Length Measuring Machine to aid in the manufacture of critical components for the global aerospace, industrial gas turbine and nuclear industries. With a number of major OEM’s amongst its customer base and strict NADCAP approvals, accurate, precise, and repeatable measurement equipment is a must. The Trimos length measuring machine successfully reduces the risks of manual measuring systems with its non-contact measurement capabilities, making it the perfect solution for a variety of Bromford Industries’ measurement needs. Customers typically require strict tolerances for a wide range of high performance critical components, making high accuracy measurement equipment a must. Due to the criticality of parts and the demanding industries in which they are used, the company must meet exceptionally high tolerances. To do so, measurements must be accurate and repeatable to within 10% of actual tolerances to ensure quality. With such a variety of components to machine and fabricate, Bromford Industries’ metrology needs are complex. Integrated quality systems and NADCAP approvals, in addition to requirements to work to a wide range of demanding bespoke OEM quality standards, mean that the company needed a variety of metrology solutions to ensure accurate, repeatable measurements every time. The Trimos Horizon ‘H’ Series Length Measuring is very simple to use, and ideal for use in the workshop area, which is exactly where Bromford Industries use it. The length measuring machine has also allowed the company to achieve accurate measurements to an extra decimal point, therefore offering extra levels of assurance and quality to its customers. Bromford Industries specialises in the manufacture of performance critical components and assemblies for aero and marine gas turbines, aircraft landing gear, static gas generators, nuclear and specialist engineering applications. The company employs over 300 people across the 5 sites, with a proficiency in high precision, complex component machining and fabrication, matched with full supply chain management. All five of its facilities is accredited to the latest AS9100 rev D aerospace standards in addition to ISO 9001:2000, ISO 14001 and comprehensive NADCAP approvals. With headquarters in Birmingham, facilities in Leicester and Alcester, and sites in the USA and India, Bromford Industries has a number of major OEM’s amongst its customer base, including Snecma, Rolls Royce, Siemens, Messier-Bugatti-Dowty, GE Power & Water and Alstom. Typical manufactured components include engine rings and casings, and critical parts for aircraft landing gear. The company has recently invested in 9 new state of the art 5 axis Okuma machining centres, making the manufacturing operation at Bromford Industries a true ‘smart factory’. In addition to the measurement of high performance critical components, Bromford Industries also uses the Trimos Horizon ‘H’ Series Length Measuring Machine to calibrate analogue Universal Gauges from Bowers Group as a digital back up. This added level of trust and assurance enables operators to be confident that the Universal Gauges are calibrated to the highest level of accuracy in a digital format, therefore ensuring accurate and repeatable measurement. Bromford Industries also has a Trimos Vertical V600 which is used in the factory on the shop floor for component measurement. In addition, Bromford Industries also uses Bowers Group’s XT3 Digital Pistol Grip Bore Gauges with Bluetooth to measure aerospace components. The ergonomic design of the XT3 bore gauge boasts a large, clear LCD display, built-in Bluetooth, and fast, accurate measurement.